A perfectly fine artist few in the U.S. have heard of named Robert Kusmirowski has a perfectly fine piece in “After Nature,” the first perfectly fine group show at New York‘s still new New Museum. Kusmirowski, from Poland, specializes in evocative models of the past, encrusted memorial recreations, and his work in “After Nature” — whose modest theme embraces a world “darkened by uncertain catastrophe” — is nothing other than a creepy redo of the primitive cabin in which Theodore Kaczynski lived, wrote, and assembled his fatal explosive packages. The poor gallery guard standing by the cabin had to keep repeating that no, the door didn’t open. (Same problem with the Bucky Fuller 1930s Dymaxion car in the lobby space at the Whitney. That guard agreed in a charming way that it would be valuable to allow us to see the quirky vehicle’s rotten or gutted or absent interior, and he would do what he could.) Everyone, of course, wants to open doors. Wouldn’t you know, at least a few of the younger folks didn’t know who the Unabomber was — or is, because Kaczynski’s still alive, 66, in a Colorado prison for the rest of his days. He keeps up with current events, though, which we know because a few weeks back the cyber-must Smoking Gun wrote that Ted was perturbed that the actual cabin was on view as part of an exhibit in the Newseum, the ill-named temple of journalism that opened this year in Washington, D.C.
“An interactive.” Where’s the display devoted to the planet’s last remaining copy editor? Unabomber hideout, real and simulacrum. Newseum and New Museum? The parallels astound. Would the prisoner have objected more, less, or not at all if he had seen the artwork advertised instead of the real thing? And would our aestheticians (or copy editors) urge us to put quotes around real thing? We now arrive at the place where the art critic weighs in, elaborating upon the differences between the two cabins and the way their differing viewers perceive and react to them. 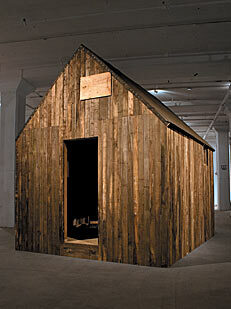 What if the museums swapped cabins? Next, there’s the obligatory art historian (not quite a critic), grounding the problem with a discussion of mimesis and reproduction in a variety of cultures and the appeal and even magic implicit in verisimilitude and theatrical imitation. Were I the initial critic, I’d find some way of dragging my reader into the Brooklyn Museum’s tableaus of American Colonial and art deco décor, dim and romantic rooms that hypnotized baby Jeff and made him wish he could escape his mother’s noise and vanish into a calm, upholstered past. 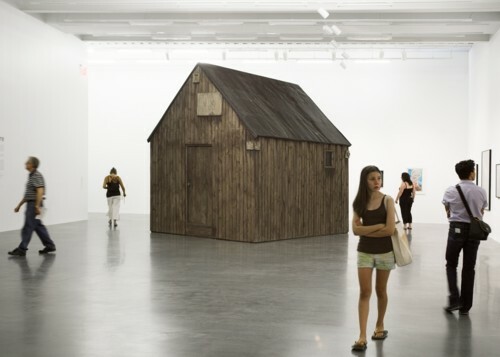 What a present-day real critic should mention, if he or she had the sense, is that in the last few years at least two other Unabomber cabins sat firmly on Manhattan art floors. Pause, by Chris Larson, was shown at Rare gallery in 2005. It had a car crashing into it — actually a repro of The Dukes of Hazzard ’69 Dodge Charger — made of lumber, too. 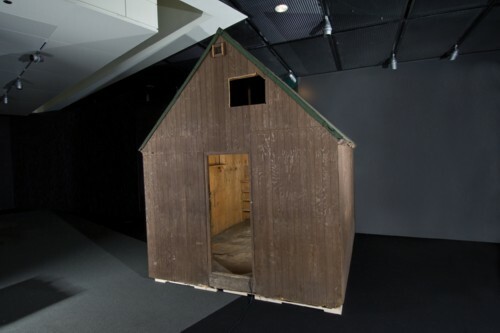 In 2007, Exit Art showed a more realistic version built by Seth Weiner, undamaged by any vehicle, except that when you walked in, you heard a digitally synthesized voice recite parts of “Life Without Principle” by Massachusetts cabin maven Henry David Thoreau. In a truly contemporary, interactive institution, one should be able to choose the soundtrack of one’s experience. So Out There must therefore ask, what exactly would you, kind reader, wish to hear spoken from beneath the Unabomber’s various floorboards?